Best NY style pizza dough recipe and 14 tips for success!! I used your recipe exactly and weighed the measurements as you suggested. I cooked one pizza of the four after about 28 hours in the fridge. I figured by baking one at a time after waiting one more day each time I could decide for myself how much better they turn out based on 1,2,3,4 days cold rise. The one day rise that I cooked was delicious so I have no doubt the next ones will be even better. My question is based on something you said. You said if you ever wondered why two identical dough recipes tasted different it’s because the one you liked was cold rise dough. I paraphrased your words there. So I was curious if you really believe that? I have a recipe that I previously used but I let it rise on the counter twice, both times for two hours. Was wondering if I use my old recipe but cold rise instead, would it turn out like yours? Thanks for the dough recipe, all the tips, it was fantastic and I loved reading the comments. Well that’s not really what I was asking so I will rephrase the question. In your discussion and tips you said how different doughs can taste so different and that’s because the good one used a cold rise, even though it’s probably very similar in the recipe, it’s just the cold rise that’s what made it better. My question was if I used my recipe which is slightly different than yours, but did the cold rise instead of the counter top rise, would it really end up just as good as yours? Question, you mention water temperature being important but don’t actually Bring up the temperature you use. Is around 110 to 120 Fahrenheit good? 110°F to active dry yeast. But from what I have read on the “instant Yeast” it states to have your liquids 120°F-130°F. So what is it? Why would a company put something on the package that didn’t work? Wait let’s talk yeast. Cause if you’re not going by the instructions then you can’t complain about a product. So as a seller if I put a product out that doesn’t work per my directions then I’m losing money cause no one is going to buy again. So are they wrong stating 120°F-130°F for instant Yeast. And yes anything over 110°F will kill your dry active yeast. But room temp is not doing the job either in helping it bloom. So how about make temps so people don’t have to guess. These temperatures are inconsistent and never the same. Can affect the outcome of food. Just my humble opinion that the majority of people aren’t using kitchen thermometers to test water temp and so manufacturers are trying to make it easy. I hear your frustration though…keep it safe and use room temp water. My yeast is very vigorous (Red Star/SAF) and doesn’t need warm water to bloom – all brands are different though so best to check the instructions since this varies by brand. Question, I usually make dough that gets left out and doubles in size after about 90 minutes. I made your recipe last night around 8pm and put it right in the fridge. It’s 9am now I just checked and it still looks pretty much the same size. I know you said with being in the fridge it will be a slow process. But should or have grown by now? I only have active dry yeast but Ive made dough plenty of times before without issue. Oh just saw this, sorry! The dough will normal show some kind of bubbling activity on bottom of container. Growth isn’t always very obvious – how did it turn out? Can I add italian seasoning to the dough? What would be the best step to incorporate it? Can I use this dough to make calzones? Ive made this literally dozens of times and it’s DELISH! I make the four, let them set in the fridge three days, and then freeze what I’m not using immediately. Never a problem. Ever! Living in Mexico, im starved for good pizza. It’s just not their thing in my town and the pizzas are horrible! Looks like a great recipe, thank you. How do you get the frozen dough ready to use? I just take it out of the freezer the morning I want pizza for dinner; after defrosted, set it on the countertop to warm it up for about 30 to 60 minutes depending on room temp. There is one thing I would like to know and that is should I proof my dough before I freeze it or can I freeze it after I mix it . Thank you in advance for your help. 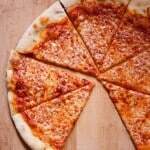 How important is dividing the dough into 4 equal pieces? 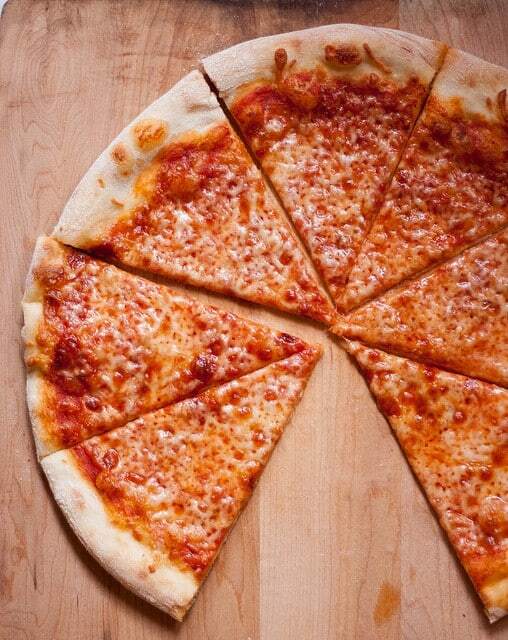 Would it be alright to divide into 6 or 8 pieces? I’m looking to make more personal size pizzas. You can divide into smaller pizzas, sure. I’d start with 6 – and if you find they are still too big, try 8 next time. most recipes tell you to not mix the yeast and the salt in the beginning but rather mix the flour with salt first and then add the water-yeast-sugar mix. which is correct? you can mix them in with the flour if you are using instant dry yeast, I’ve never had a problem. I should clarify the instructions because you should add flour first, then salt and yeast but not directly on top of each other. In her bread book, Rose Levy Beranbaum adds recommends adding salt to one side of the flour bowl and yeast to the other. If you are more comfortable using the tradition route, add it the way you are describing which is often used for active dry yeast. The brand of active dry yeast that I use can be directly mixed into the flour without “activating” it. When you say not to add them on top of eachother do you mean mixing them between each new addition… such as: add flour to water, mix, add salt, mix, then add sugar and mix? We are gluten intolerant and recently found that we can have flour from Germany because it’s clean!!!! We are making pizza with regular flour for the first time for one of my sweet kiddos tonight! We are soooo excited and don’t have the patience to wait the 3 days to rise in the fridge. Should we find a different recipe this time or will this work well but will just be better with a 3 day rise? Thank you for all the tips…..soooo excited!! Yes, you could – this would probably rise a lot slower than you might be used to because of the lower amount of yeast. If you skip the refrigeration period, you would let it rise until doubled on your kitchen counter (room temperature). Then divide and shape into balls and let rest at least 20 to 30 minutes. If you don’t eat right way, place in fridge and take out about an hour beforehand. Great, thanks so much for the quick reply! Do you think 3-4 hours would be enough? Great recipe! I want to freeze so I have it on hand when needed. Do I freeze it right away or wait the 48/72 hours first?? I usually just put what I don’t end up using in the freezer, so I’d wait at least 24 hours. I don’t think you have to wait the full 3 days. I’d pull the dough from the fridge more than an hour before using and be mindful of its temperature afterward. You want it to be at least 75-77 F in the center before opening it, which is higher than typical room temp and takes longer to achieve. I am using active dry yeast for this recipe. So as always I mixed it into warm water to activate it. Can you please clarify for yeast activation process for both style or all yeasts. Also.i added garlic salt instead of regular salt along with some italian seasoning the non salted type. Thanks for explaining everything like you did, I’ve read a lot of dough recipes online but you broke it down so I have a better understanding of why instead of just how. Hi Marie – I somehow happened across your site (I’m sure it was a google search) but just wanted to say thanks and let you know I love this recipe. I live in Ohio, but spent 4 years working in Manhattan a few years ago and I’ve been sooooo missing NYC pizza!. I’ve only made the dough 4 times so I’m still in learning mode.. but I’m still trying to figure out how to get it done in approx. 6 minutes. I’m using a pizza stone, on the top shelf and letting my oven heat up at 500 degrees for at least 60 minutes… but still needing approx 8 minutes finish. That may just be my oven? I’m planning to experiment with the broiler for 5-10 to heat up the stone on Friday and see how that goes :). For what it’s worth… I’ve tried a couple different cheese’s… and I totally agree on the low-moisture whole milk mozzarella. I’m sure it’s a matter of taste, but I came across a brand on another NYC pizza related site called Polly-O. I can buy it here in Ohio at of all places Wally-Mart,, but it is delicious! Anyway.. Thanks for the great tips and info. Cheers! Is bread flour the same as wheat flour? And with protein do you mean gluten? Hi Vasilis – You should use a flour with 12 to 13% protein, which refers to the gluten in the flour. This really helped, thank you very much! I never leave comments, but this recipe is great! Thank you for all the tips! I am from New York and am currently living in Texas and I’ve been in need of good pizza. I can never get my crust as thin as I’d like. This recipe gave a good, flavorful dough that I was able to get very thin. I weighed my flour, I used mostly King Arthur AP flour with about 1.5 cups of it bread flour. The dough seemed too wet so I had to add in some more. I let it sit for two days. Usually I cook my pizza With the oven at 450, since it’s august and hot I didn’t want to put the oven all the way up to 550 since 450 works just fine with my other dough recipe. I should have put the oven up to 550 though as the bottom didn’t brown as quickly as the top, but it was still the best pizza I’ve ever made and I will put the oven temp up higher next time. Thank you! I’ve never mixed the AP and bread flour for a pizza (although I have for bread) – good idea! I’ll have to try it! Hi, if I just want to make one pizza do I just use 1/4 of all the ingredients including yeast? Also I was thinking of using wholemeal flour but apparently that can make it too light, I’ve read that 2/3 regular flour to 1/3 wholemeal is better, any thoughts on that? Finally I was planning on replacing sugar with a tbs of honey or two if that would work, might throw in some ground ginger for taste? This is the first time I’ve tried this so any tips much appreciated! Cheers! If you want to use whole grain flour, try to use bread flour with the whole meal. I haven’t tried that combo with pizza but that works well for me with bread. you can definitely easily replace the sugar with honey – I’m not sure about the ginger but I think it would depend on what toppings you are going to use – can’t hurt to try? And yes, you can use 1/4 of the ingredients or you can freeze the rest of the dough. 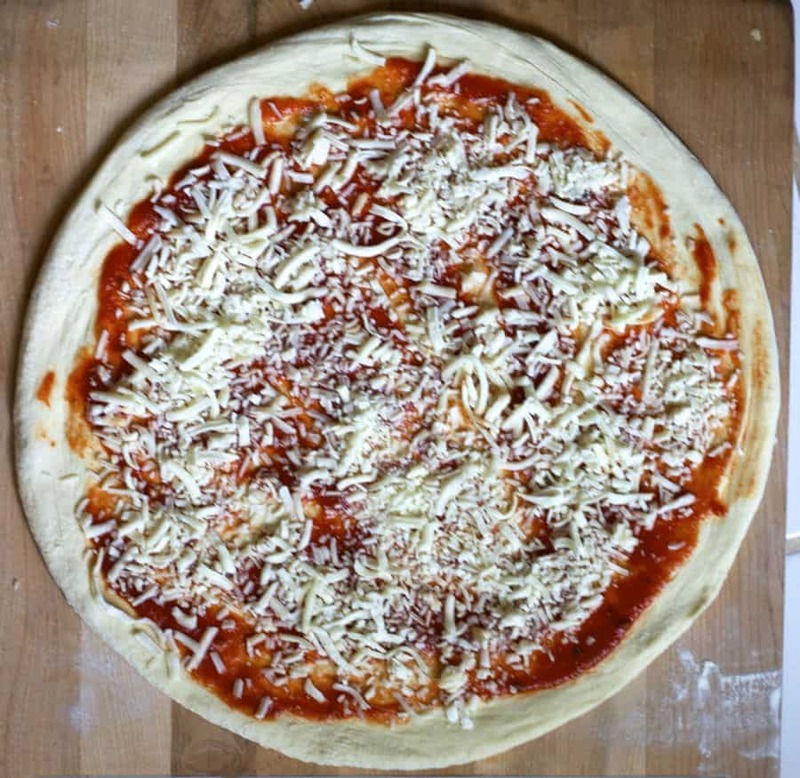 Thanks for publishing this pizza recipe and the wonderful tips. I checked the amount of water required as given in the list of ingredients. I noticed that 17.4 oz converts into ~515 mL (g) of water and 2 1/4 cup converts into 532 mL (g) of water and both are far from the 493 g given. No doubt the amount of water is critical in that it determines the hardness/softness of dough. Should I just follow the weight measure of 493 g and neglect the volume? Thanks. Hi George, over the years I’ve received many questions about the conversions. It’s a bit confusing, I know. If you look at the flour weight (28 ounces and take 62% of that, it will give you the weight of the needed water, 17.4 ounces). Using my flour, 28 ounces converts to 796 grams. If you measure by grams, 62% of 796 will give you 493 grams of water. All the other measurements (sugar, salt, oil) are rounded to volumetric measures that are convenient (because it’s not practical to ask someone to measure 1.73 teaspoons, for example). I know that is confusing but I’d say just stick with either grams or ounces and you will get the target hydration (62%) that is intended. I hope that helps? Perfcet everytime, Thank you so much for this receipe. Would you recommend me dressing the pizza dough on the stone while hot if I currently do not own a peel? Glad you like it! If you don’t have a peel you can use a pan or place the pizza on parchment paper on top of a pan and slide it on the hot stone. So I don’t use a brick oven – I use a home oven with some tricks to get a good bake or I use a propane fueled Blackstone oven that mimics a brick oven. One of my best friends has a custom brick outdoor oven and he said it’s important to let the oven sit for 40 minutes after the initial burn so the heat can saturate/penetrate or be evenly distributed to all the bricks. After the initial burn, he cleans the floor of the oven and then closes the door for 40 minutes so the oven temperature can equalize. If this doesn’t work and the floor still isn’t reaching a good enough temp, it might be because there is water getting in the oven and that is causing the floor not to reach high enough temp. And another question, do you Cook with active dry yeast? Sorry, i didnt read all 890 coments, so im asking mybe again, if u Cook in log outside brick pizza oven, is there anything secrets? Bcoz i tried 3x, once oven was too Hot and all burn from top but under wasnt realy ready, mostly i have problems getting dought crispy before top is burned, oven is made perfectly from italy oven plans. Shall i close entry while i Cook? And greetings from Latvia. I’ve had both kinds of ovens (gas and electric) over the years, and it works for both in my experience. Hi, just a little confused about the number of pizzas the recipe will bake. You’ve listed 2-14″ pizzas if halved and 2-14″ pizzas for 4 balls of dough. I made a similar recipe and can’t wait to use yours as I’m new to this. Thanks so much for posting it. Hi Debbie – I mean to say that if you cut the recipe in half, you will have 2 balls of dough and if you make the whole recipe you will have 4 balls of dough – I hope that makes more sense? I did this recipe exactly as written, except i only had generic unbleached flour on hand. This a great pizza dough recipe. Pie turned perfect. Putting pie up high in oven is a valuable tip. Thanks for that. I use pace picante mild as sauce and i sprinkle pizza seasoning over it, it is surprisingly delicious and a little spicy. This recipe and website are amazing. I plan to make this pizza dough recipe for the second time soon. I have fine pastry flour instead of all-purpose flour. Do you think the dough will still come out correctly? I’m afraid not…the key to a good pizza is a high protein flour. Pastry flour is low protein and useful when you want a very tender, delicate pastry. So the short answer is definitely no pastry flour – You should use a flour with a protein content of 11% or higher (Gold Medal all purpose, King Arthur all purpose, and Bob’s Red Mill all purpose flours and all bread flours). You can get a general idea by dividing the protein on the nutrition label by the serving size (eg, 3 grams protein per serving/30 grams flour per serving) and then multiplying by 100 to get the percentage. This isn’t 100% accurate though because companies are allowed to round information on their nutrition label (so even though it may have 2.8 grams of protein per serving, they are allowed to say 3 grams) – hope this wasn’t too much info! Is it possible to use fresh yeast instead of instant dry?, If so how much fresh yeast should I use for this recipe? can be divided in half to make two 14-inch pizzas. I’m confused with that, is the yield 4 or 2 – 14″ pizzas? What is best way to form the pie. My cold dough rise is 2x in size with a lot of gas. Any suggestions? What works best? Hi Nancy – yes, I see it shows twice (15.6 15.6) – you can ignore the second one I’ll delete it now. I think there was a glitch with the website. I often use volume measure only for salt and sugar because it’s faster (although weighing flour is faster than measuring volume). Does that help? Because I like to weight all my ingredients, so when I see your recipe, I am hesitated to start my dough……..should I ignore the cup and oz measurement, but used your grams measurement. Hi Nancy – yes, I see what you are saying. This question has come up before. The answer to your question about the salt and sugar is that the weights are the most accurate, but I can’t translate that weight to volume by asking folks to use 1.34 teaspoons or something like – do you know what I mean? The flour may seem off because I use a pizza dough calculator and I’m not sure what weight they use for one cup of flour (there is definitely some variation here) – if you are using King Arthur, this recipe will work well (that’s what I use) – I actually prefer their all purpose flour now because it’s still highish protein that gives you a nice crisp without being too heavy. Overall, I’d use the gram measures for flour and water but for convenience I’d use the teaspoon/tablespoon measures for salt, oil, and sugar. Hope that helps. I will follow your instructions and give it a try. Can you freeze the dough and if so for how long? Hi, yes I often freeze it – the rule of thumb that I’ve always read is 1 to 3 months. I haven’t tried for longer than that..
Can you freeze the dough if so for how long? I LOVE this pizza dough recipe! My husband is insanely picky about the pizza that he likes. We decided to cut off eating at restaurants/getting delivery all together, so we wanted a good dough recipes for those nights when delivery pizza was too tempting. This one is perfect. The texture is great, the dough comes together very quickly, and it is very easy to form. You do have to plan ahead a little bit, but I just throw the dough together the night before I’m going to make it and it’s perfect. At what temperature should the water be when you add it to the flour? I don’t pay much attention to water temperature because the dough will quickly equalize to the refrigerator temperature. That being said, I wouldn’t use warm or hot water because hot water can kill the yeast if it’s too hot and warm dough may bring down the temperature of other foods in the fridge. I use room temperature or cool water. My son is14 and is on the autism spectrum so he is really picky about what he eats that is homemade.I have a recipe for a pizza dough that’s ok and he eats it, but after trying your dough he loves it. Says he loves mine but you’re is better ?so hat’s off to you and thanks for an even better dough that my son approves of. Also bonus everybody else in the family likes. The fact that I can make it in advance and have it waiting for me is also a plus. Again thanks! So glad I happened upon your page here! This was the biggest help, and thank you so much! I just had some of the best pizza I could have hoped for made by yours truly following your method plus all the tips and tricks. You’re the bomb. Thanks again!! Thanks Marie! I just made pizza using your recipe and everyone thought it was great. The crust rose nicely and was very crispy. The only mistake I made was burning the top of the crust a little. Also the cheese I used made it way too greasy. Otherwise it was a great pizza. I used your pizza sauce recipe, and really liked it. This may be a silly question but what temperature is your refridgerator where you proof the dough. I have tried using a fridge in the past with little sucess and am wondering if mine is too cold at 36 degrees. You dough recipe is quite close to mine which seems to work on the counter with about eight hours rise followed by punching and then two more hours, but I have yet to make a good crust in the fridge. Hi Paul -that’s good to know. I may try that for a same day dough – at least it’s a slow proof so it would add good flavor. Do you feel that the flavor isn’t there with the cold proof? What are you experiencing? Maybe proof at room temp for half the time you normally do (ie, 3 or 4 hours, as you describe above) and then place dough overnight in the fridge? I’m not sure how many days the dough would last but it would definitely be great the next day and maybe 2 days? My fridge temp is the same as yours and I don’t have a problem although day 2 and day 3 are always better. I’ve even used it on day 5! Day 1 isn’t as good but that might be solved by doing a few hours of room temp proof first. This is such a great recipe. In fact it’s so good, friends have offered to pay me to keep them supplied with fresh dough to keep in their freezer so they always have it at the ready. I just finished making a fresh batch this morning and it’s now chilling in the fridge for pizza fabulosity later this week. The cold proof really adds to the flavour and is definitely worth the wait! I agree Melissa – it is worth the wait – and that’s funny about the friends offering to pay for it! I love this recipe! Thank you so much. My husband got a stone pizza maker for fathers day on his grill /smoker. The crust is amazing and will keep using this. The kids love making there own pizza. Thank you for sharing this recipe and all the helpful tips how to make it. I do have a question. When you make this and want to put it in the freezer do you put it in the freezer right away after making it and thaw it in the refrigerator to rise? Hi Lynn, I have done it both ways – I don’t freeze dough that often but that’s what I’d do: freeze right away after making and then thaw it in the refrigerator before using. Mine usually defrosts in the fridge by dinnertime if I take the dough out of the freezer in the morning. I have also placed leftover dough in the freezer but the other option works better. I found that proofing in the fridge takes too long and doesn’t make any difference in the taste. I pop this into the bread maker a couple hours before i want to make pizza and it turns out awesome. Thanks for the awesome recipe! I also use a little more yeast than what’s recommended here. I think this recipe’s a little too conservative with the yeast (yes I read the tip). I use cheap White Lily Bread flour from kroger, and it works great, but I would agree, can’t go wrong with king arthur. I used to look for whole milk low moisture mozzerella, and that was good, but I find pre-grated to work just fine and it melts fine. I also like to leave some garlic, oregano, basil, salt and pepper sitting in some olive oil, and baste the crust before I stick it in the oven. Pizza steel works great. Pizza steel with 700 degree charcoal grill = too much heat. Pizza steel in the oven at 500-550 degrees has worked perfectly. Love this recipe. Glad you like it Tyler! basting the crust sounds awesome! Like Jeff I’m here in Kentucky where good NY Style Pizza is far and few between. I read a lot of different ways to make the dough and went with yours based on the flavor attributes that the Cold Risen dough would give me. I was impressed as I made my first pies tonight. 1 Traditional Pepperoni and one Double (type) Sausage. I could really enjoy the aroma of the dough during prep and the taste was there. I actually used it after the 72 hours and it was awesome. I used Love This Kitchen’s Rectangular Ultimate pizza stone at 550 degrees in my GE Profile wall ovens. I found no need to use the broiler but my dual wall ovens have top heating elements not lower ones and my toppings and cheese cooked evenly with the crust. On the topic of peel I went with a wood one that had a tapered edge from Amazon that was reasonable priced and I am glad. No issues turning the pie during cooking or removing it. Wood is hands down the best to assemble and place in oven without sticking and I see no need for metal one at this point. I did go with Corn Meal after reading many opinions as to go flour or corn meal and I think I made the right choice. When I took the first slice of Pepperoni and could fold it I was ready to taste and the balance of the dough, sauce, cheese and pepperoni was like an authentic pie that I would get when back in NY. Thanks for your work and tips. your pizza sounds awesome! I love the added flavor of the corn meal on the bottom – I’m going to use that next time too. thank you for the kind words -glad you all enjoyed it! And for you to master the launch from the peel on the first try? that’s great! One thing I left out of my original post was I was one of those “I don’t use a scale” kind of cooks. I actually break my Brother In Law’s chops when at his house about using a scale. I am so glad that I took your advice and used the scale. My Yield was spot on for my first single batch dough run with a normal batch. Did a double batch today and it was spot on thanks to the scale. Literally only Fifteen bucks at Wal-Mart digital with tare wt. setting. It made life easier. I also was prepared before diving in by reading all of the tips, measuring everything out in advance. The tips really helped. 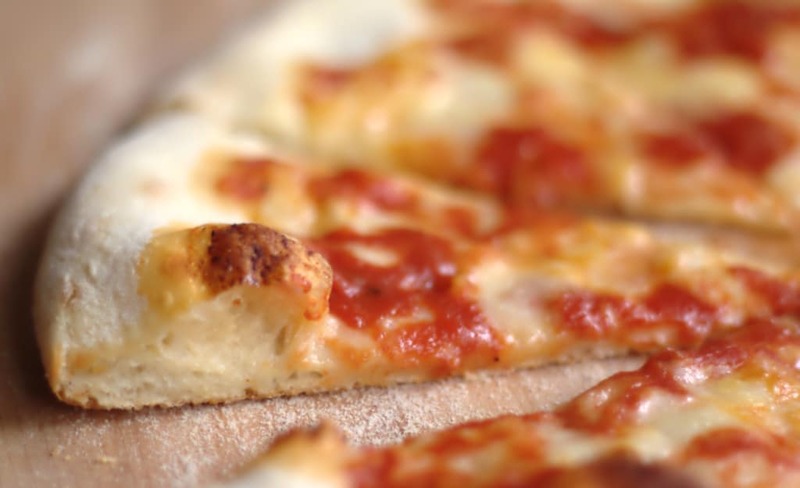 The Corn meal really helps the pie slide better than flour according to many NY Pizza Chefs recommendations and for finished appearance there are no white flour spots that I have seen even on commercial pizza shops slices. It really worked as described. Oh Brian, I can totally relate! I refused to use a scale for years! My mother doesn’t measure a thing and her cooking is all by feel – this is how I grew up so the use of a scale seemed to foreign and fussy to me. Fast forward to now and I absolutely never make pizza dough without it. Mostly because it’s easier than measuring and the dough just comes out so much better. So I’m with ya! And yes, scales are not expensive (probably the cost of one large pizza). When can you freeze after the initial refrigeration 24- 72 hr. I already made the dough I only waited 24 hours an? made my first pizza it came out excellent I must say I cut it in half but used the full amount of yeast. I’ve done it after 1 day or after 3 days. It’s a bit better after 1 day to freeze it in my opinion but still very good after 3 days. I do have a question. My oven only goes up to 450 degrees. What, if anything, should I compensate for this? Just leave the pizza in longer? Are you using a baking steel or baking stone? If so, you can use the broil feature to heat up your stone/steel (maybe try on 2nd shelf to start and then change based on results) and then launch your pizza- once the stone gets hot enough, you can lower the setting a bi to bake the top. If I were you, I’d probably begin by just using the max temp (in your case, 450 degrees) and then try different options. you will probably need more like 10 minutes or so to bake a pizza at a lower temperature. I’d try the broiler “trick” next, which I think would heat the oven past 450. If you happen to own an infared thermometer, that would help determine how much hotter the oven would get (aim at the stone when using 450 vs using broil feature). Thank you so much. High quality tomato products may be a challenge. We will see what Kroger has to offer. I did not see the fresh oregano on the DiFara pizza, but that might not be bad to put in the uncooked sauce and apply it all come together in the oven. I have two pizza stones that I will be using. The dough went in the refrigerator last night (Thursday) and I will be making pizza on Saturday night. I’ll let you know how it goes. Thanks. All the best. That recipe should be able to take 550 on a pizza stone. Shoot for 5.5 minutes, turning once halfway through the bake. This looks good. My family just got back from a trip to NYC for a week (work stuff and vacation). My daughter and I went to Di Fara’s in Brooklyn; which may have been a mistake. Now all other pizza seems meaningless. I am going to try to replicate as best I can. It’s just hard to find a good pie in KY. Your recipes give me some hope that it might be possible. All the best. Really good quality dough. The recipe is almost identical to Tony Gemignani’s pizza crust video on YouTube and elsewhere. No matter. My only tweak was to use Caputo 00 Chef’s Flour, which gives me great results even on my home oven at 550°F. Thanks for the included tips and other useful notes. Glad you liked it! I have Tony’s book (but haven’t checked out his YouTube channel), but haven’t gotten around to trying his pizza doughs, but will have to some day soon. The only other dough I do make is a simple Neopolitan dough where I use Caputo’s in my BlackStone oven at much higher temps – will try to make a NY pizza hybrid with it (with the oil and sugar) -sounds good! The Caputo flour is pretty amazing!! I’ve heard of many folks using half and half (All purpose and Caputo’s 00). Thank you for getting back to me, Marie. I made a recipe in which Gemingnani’s name was listed as a co-author. It called for 7 cups of flour and 2 1/4 cups of water. That produced a rather dry dough that I almost fed to the garbage can. I decided to go with it anyway and after about 12 hours in the fridge the dough balls actually became more moist and pliable. The baked pizza was very good. Your recipe asks for about 5 1/2 cups of flour and the same amount of water. That’s a huge difference which produces a much wetter dough and a terrific open crumb which I like a lot. It’s worth the extra effort to deal with the wetter dough to get such a nice interior. Can this recipe be doubled? I’m hosting a group of students and I’m going to try your dough. I have a Bosch that will easily handle a double recipe so it would save time. Also, have you ever used this dough on the grill? Thank you for posting, sounds like a great recipe!!! I love this recipe but having trouble with transferring the pizza from the pizza peel to the stone, it keeps sticking. I’ve floured the peel and shake it to see how it will slide but once I put on the sauce and cheese it doesn’t slide off very well? Any tips? you can use parchment paper on top of the pizza peel to transfer it to the oven. Sometimes, if you add too much sauce and/or cheese, it gets too heavy and it is hard to move. The other tip is to act quickly – the pizza will start to stick after a few minutes so try to launch the pizza right after you add the toppings. Use cornmeal instead of flour on the peel. Quite slippery.